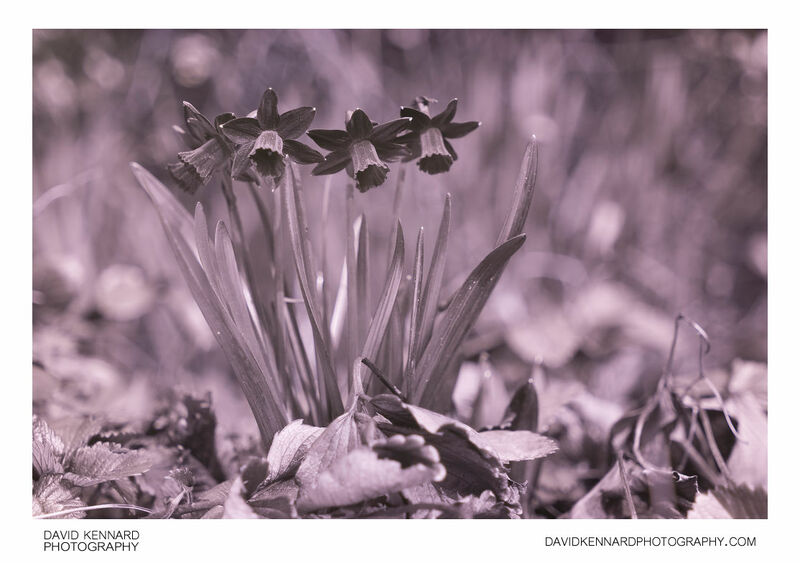 Ultraviolet photo of Narcissus cyclamineus 'Tête-à-tête' flowering amongst dead strawberry plant leaves. Narcissus cyclamineus is a dwarf daffodil, growing to a height of around 15 - 20 cm. The Tête-à-tête cultivar has slightly reflexed tepals and a corona (trumpet), both of which appear a bright yellow colour in visible light. Whereas in ultraviolet light the flower appears very dark. Natural light with reflector below / in front of flowers to reflect light back up at the flowers. Combined with 2x full spectrum modified Vivitar 283 flashes firing on full power.